Terrance Fry came to know The Salvation Army the same way many people do – as a client through our food pantry. As a senior on a fixed income, Terrence fell on hard times a few years ago and was unable to pay all of his household bills and buy groceries for himself and his family. Initially, Terrence’s pride held him back from seeking help from a charity. He worked hard throughout his life to provide for his family, and now he found himself unable to do so. Terrence admitted that it was hard to take the first step to ask for help, but after meeting with the case worker and staff at The Salvation Army, he felt much more comfortable visiting the pantry when he needed it. 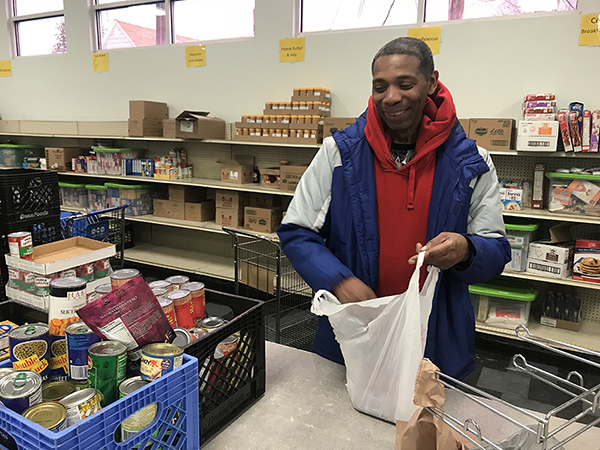 Terrence visited the food pantry for a few months until he was back on his feet, and also received assistance paying his utility bill to prevent a disconnect from gas and electric. This was exactly the help he needed – food and warmth to help meet some of the basic necessities of life. After struggling for months to make ends meet, Terrence’s financial situation changed when he found work through the Experience Works program, aimed at helping senior citizens find employment. Through this program, Terrence spent a few years working for The Salvation Army of Michigan City as a custodian. This work was enough to get him back to financial stability. These days, although no longer working for The Salvation Army, Terrence still helps out. He occasionally drops in to help out at the local Army – helping unload the delivery trucks, packing bags in the food pantry, or even doing some light cleaning. Getting to know The Salvation Army of Michigan City as a client, employee and now as a volunteer, Terrence has certainly become part of the family. He is someone who took advantage of the programs and services at The Salvation Army, worked toward self-sufficiency and ultimately began giving back to others.